‘Forever young, I want to be forever young! Do you really want to live forever, forever and ever young?’ is what has been sung in a popular song. This question has been asked frequently by a lot of people. The answer to this question certainly differs per person. Yet, we are trying to figure out for hundreds of years what makes people older and what doesn’t, in order to live longer ourselves. One of the great ways to investigate this is by looking at Blue Zones. In this article we will dive into one specific area in Sardinia and elaborate on the research that has been done to identify a geographic area characterized by extreme longevity. Secondly, we will look at the characteristics Blue Zones share and what makes the population’s longevity relatively high in these zones. The age expectancy of someone is short-said determined by two factors, namely genes and lifestyle. The impact of each factor still seems to be quite ambiguous. Although the relative influence of each component might differ according to several studies, the common findings state that even though we cannot fully impact the genetic lottery we encounter (for now), we do have an influence on our life expectancy through our lifestyle. There is still a lot confusion about what really helps us live longer or better. There are a lot of myths concerning longevity. For example, the aging process cannot be stopped or slowed down. Since, based on our capabilities, a person’s average life expectancy could be around 90 years old, nevertheless, this turns about the be around 7 years less, on average, due to external factors such as smoking, drinking and bad eating patterns. One could decrease this turndown of approximately 7 years by improving lifestyle habits. Researchers have been trying to figure out which factors impact our mental and physical health in a positive way and by how much. Previous studies show evidence of a higher life expectancy in certain geographical areas. National Geographic and the National Institute of Aging have found four demographic confirmed areas that are geographically defined and showed a significant higher life expectancy compared to other areas in the world. These areas are so-called Blue Zones. 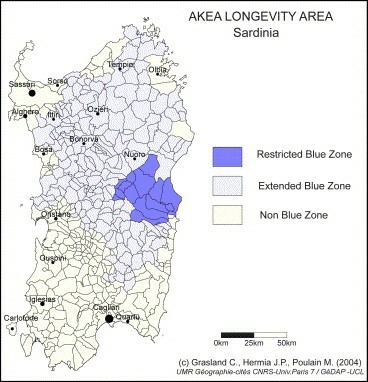 In a recent study it was found that Sardinia, where one of the Blue Zones is located, has a prevalence of centenarians which are higher than in other European countries. Prior research contained invalidated results which were a cause of age misreporting or other errors in data collection. Therefore this specific research, done by Michel Poulain and Gianni Pes in 2004, showed remarkable results for one of the first times. Sardinia is a very interesting place on its own, since the Sardinian population remained genetically isolated for a number of centuries and has experienced no immigration in recent history. Moreover, the living habits in Sardinia have remained almost constant over the years. Nevertheless, this test is only valid under two conditions, namely, that the expected number of centenarians in the municipality is larger than five and a minimum number of 2283 newborns. Yet, this was not observable in any of the municipalities. Therefore another model was required. The multiscalar smoothing method based on Gaussian neighborhood distribution allows the study of the spatial concentration of centenarians as a continuum, and is not limited by the division of the municipalities. To apply this model an optimum scale in the Gaussian neighborhood distribution has to be selected that on one hand provides the best compromise between sufficiently large sample sizes and on the other hand has the integrity of the information on the spatial distribution of centenarians. In their research they figured a 15 kilometer Gaussian smoothing was large enough to capture the required minimal number of newborns without losing too much information on the spatial variation. In the picture below the graph that has been conducted with the above described method. The intensity of the color blue is proportional to the value of ELI. 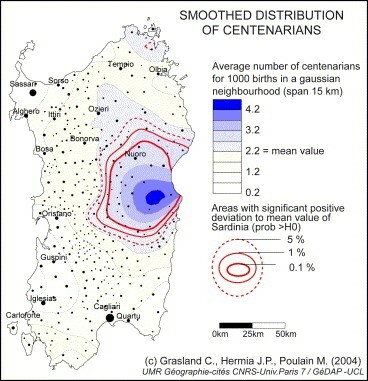 The mapping shows the significant positive differences between observed numbers of centenarians and theoretical numbers based of average Sardinian value with the Gaussian smoothing method and 15 kilometers distance. The graphical presentation of the smoothed distribution of centenarians suggests evidently that there is a geographic area characterized by a higher prevalence of exceptional longevity. The blue area is known as the previously mentioned Blue Zone. In the world we reckon seven Blue Zones at this moment. In Sardinia this area is located in the south-east of the Nuoro province and covers all the mountainous areas of central Sardinia. The area has been investigated very precisely and resulted in the following figure. This image shows the final shaping of the Restricted Blue Zone (RBZ). For the entire Blue Zone 631 of the 240,000 citizens became centenarians, of which 269 where men and 362 were women born in the area between 1880 and 1900. This number is an impressively 50% higher than the average in Sardinia. Now that we have obtained the geographical area of one of the Blue Zones, we are interested in the major characteristics of the Blue Zone. What in the environment, lifestyle and habits of the citizen of this very specific area contributes to such a large difference in life expectancy? Based on the demographic work previously discussed, Michel Poulain and Dan Buettner identified seven Blue Zones where the population lives significantly longer due to a specific lifestyle and living environment. The isolated character of many Blue Zones works conducive for the preservation of the traditional lifestyle. Each Blue Zone knows its own traditions and characteristics and we will name a few of them in order to get you inspired. All of these traditional lifestyles include a lot of physical activity. Notwithstanding, this does not concern exercise in particular. In all the Blue Zones, the largest part of the population does not play any sport, yet obtains physical effort via daily tasks such as walking the stairs and cooking without any machines. Moreover, social interaction and locally produced nutrition were also common factors. The diet in Sardinia is mostly plant-based accentuated with foods that they can carry into the fields where they live. Another interesting fact is that the centenaries not only reach the age of 100, they do so with extraordinary vigor, still riding their bike to work and chop wood. According to several researchers including Buettner, the most salient elements of the Sardinian society is how they treat older people. Whereas social equity peaks for most western countries around the age of 24, in Sardinia this social peak is observed at a much higher age. Here social equity is funded by knowledge and experience. 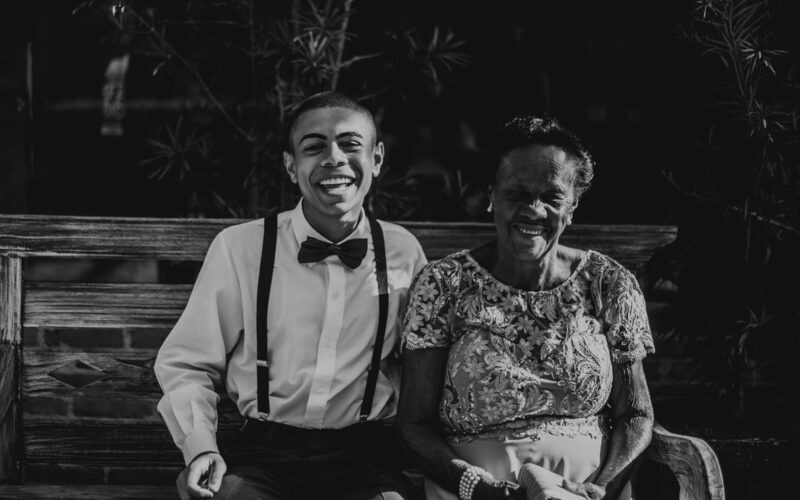 As it turns out, this attitude is not only good for your aging parents, to keep them close to your family, but it resulted in lower rates of mortality and disease for their grandchildren as well. This effect is known as the grandmother effect. In the Venn diagram below, overlapping and non-overlapping features of three Blue Zones are presented. In Japan, once again, a plant-based diet full of vegetables is conducted. Besides that, in Okinawa they have small tricks such as using smaller plates which makes you eat less. In addition, before they start eating they speak the words: ‘Hara hachi bun me’, invented by Confucius, which reminds people to only eat until they are 80 percent full. Like Sardinia, Okinawa knows a few social constructs that we can associate with longevity too. In Japan they invented the Moai which are social support groups of around six persons which provide varying support from social, financial, health or spiritual interests. With the Moai, there is always someone that has your back and keeps you from isolation, which is huge problem in a lot of western countries. Another interesting phenomenon in Okinawa is that there simply is no word for retirement. In the western world people tend to divide their life into parts where the first part includes working and the second part retirement. Instead, they live by one word: Ikigai, which a concept that means ‘a reason for being’. It is the reason why you wake up every morning. In Loma Linda, people took their diet from the bible where there is spoken of legumes, seeds and green plants. In the weekend there is a sanctuary, where they will dedicate 24 hours of their week, no matter how busy or stressed they are. During the sanctuary they focus on their social network and value nature walks during this 24 hour break very highly. The power of such things lies with in the regularity. – Connect, isolation should be avoided at all times. When it comes to longevity there is no short-term fix or some kind of pill. By following the above mentioned principle one might live a longer and healthier life. For the diehard tryer, one might considering booking a one way ticket to Sardinia, which doesn’t sound bad at all! Dit artikel is geschreven door: Anne Dumoulin. Poulain M.; Pes G.M. ; Grasland C.; Carru C.; Ferucci L.; Baggio G.; Franceschi C.; Deiana L. (2004). “Identification of a Geographic Area Characterized by Extreme Longevity in the Sardinia Island: the AKEA study”. Experimental Gerontology. 39 (9): 1423–1429. doi:10.1016/j.exger.2004.06.016.